From Yorkshire’s North Sea coast to the Irish Sea in Cumbria, for the past week we’ve been travelling across the north of England in the Classy Chassis. Incredibly, we’ve seen more sheep and lambs in seven days than we’ve seen in sixteen years living near Southampton. Of course, lambing time means the flocks are brought down from the moors to have their lambs in sheltered areas – but somehow I’d forgotten that. The sight of so many was such a pleasure; similarly the rolling moors, dotted here and there with stone-built villages and farmhouses. Bleak in the rain, but even so, old times and old memories brought a lump to my throat. After taking delivery of our new Chausson 737 motorhome four weeks ago from TC Motorhomes in Herne Bay, Kent, Capt Peter and I decided our ‘maiden voyage’ should be to visit our family and friends in the north. We’d hoped for fine weather, but it was a blustery journey of hail storms and sleet all the way to our daughter’s home just outside Scarborough. For three days, rain and biting north-easterlies meant we did more chatting by a log fire than walking in the rain. Typical Bank Holiday weather, but at least we had our treat of fish & chips in Louise’s cosy farmhouse kitchen, and not in the teeth of a gale on Scarborough sea-front. On Saturday morning we said farewell and set off westwards, visiting my aunt in York en route. 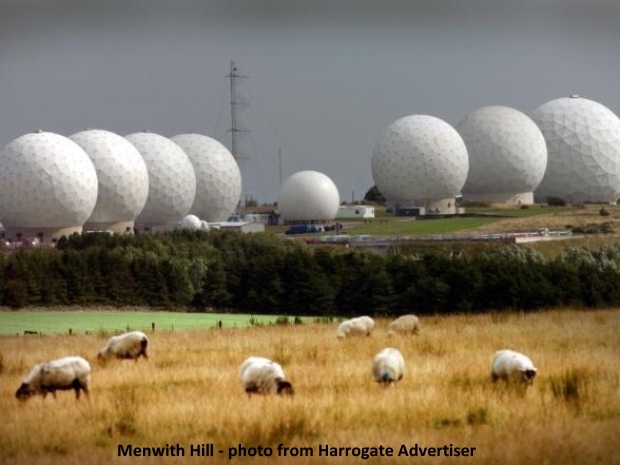 Later, touching on Harrogate, we took the A59 road towards Skipton, passing the giant’s nest of great white ‘eggs’ at Menwith Hill. This highly secret (ha ha) listening post was manned by the US Air Force in my young day, but now, it seems, the RAF have taken over. In name at least. Our base for the night was Harefield Hall at Pateley Bridge in Nidderdale – one of many country hotels, pubs and restaurants around the UK which offer a night’s free parking for motorhomes in return for custom. (To join the scheme, buy the Brit Stops booklist of stopping places.) We phoned ahead and found a friendly welcome, excellent service, and delicious food in beautiful surroundings. Finding a level parking spot was a bit of a challenge as most of the parking is on a slope, although after a few tries we managed it! Next morning, we headed across the tops for Wharfedale and the market town of Otley, where we lived for 15 years while our children were growing up. Meeting our old friend Sue, we had a Sunday lunch of roast beef & Yorkshire puds at a local pub, The Roebuck. By the time I had my first drink in there, the Malice had disappeared. 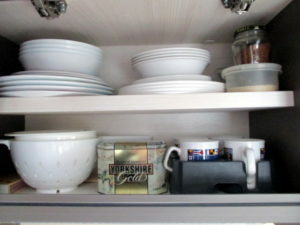 At that time the Spite boasted just two rooms, one with darts and dominoes, the other a kind of snug – no bar, just a tiny serving hatch. 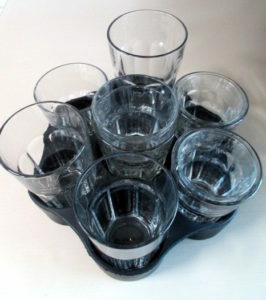 The landlord took our orders, returning some minutes later with a jug of beer which he promptly served into two glasses. I was told it came straight from a barrel out the back – no pumps. It was like stepping back to another time. When Capt Peter and I came to live in Otley a few years later, the Spite had ‘knocked through’ and made a proper bar. Since then it has expanded considerably, with good parking, a spacious restaurant area and seating outside which faces south over the Wharfe Valley. In the past year we’ve been twice, and the welcome was warm, the food home-cooked and very good. All too soon it was time to say goodbye to our friend, and we headed on through Ilkley to the Bolton Abbey Caravan Club site on the Duke of Devonshire’s estate. That morning the Wharfe was in spate, and the rain belting down – perhaps not the best day to go walking by The Strid. 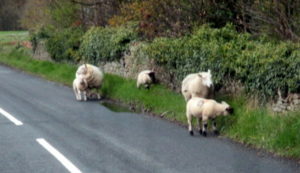 So we decided to move on westwards – and promptly met a herd of moorland sheep on the road by Bolton Abbey. 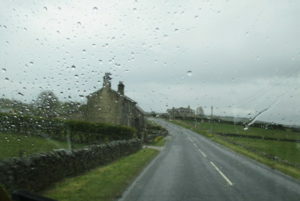 An hour later, however, we were skirting the Lake District and – oh joy! – the sun was shining. It even tempted us to park the motorhome and venture by steam train from Haverthwaite to Lakeside at the foot of Windermere. 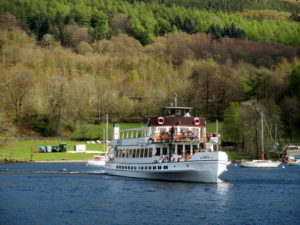 Calm water, russet-coloured mountains, a Victorian hotel and even a pleasure boat formed a perfect picture. It was a shame we had to move on. Narrow, switchback roads over the hills and around the fells brought us to our destination – the Cumbrian coast at Haverigg, where our travelling friends, Anne & Fred, have a home overlooking the estuary. 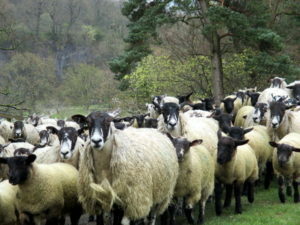 Along the way we passed bluebell woods and more fields of grazing sheep – white-faced, shaggy-coated Herdwicks this time, their lambs in fifty shades of grey. Our friends took us to the Dock Museum at Barrow in Furness – small, free, and perfect for both adults and children. A great collection of beautiful ship models dating back to the mid-19thC – alongside a fascinating history of Barrow’s rapid development in the shipbuilding industry. We loved it. And just as we thought winter was going on forever – did we really have ice on the windscreen ten days ago? – next day the wind changed to southerly, the sun turned up to tanning power, and suddenly it was summer! Spring in England – glorious but unpredictable as ever. We didn’t do the long walks this trip, but on the plus side we did find a place for the plastic plates (see previous blog). 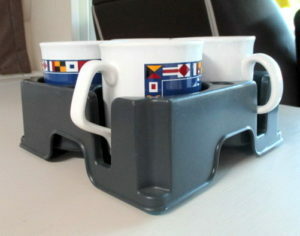 From a local yacht-chandlers we found a rack for the pottery mugs, plus a moulded rubber container for the glass tumblers. So that’s the Classy Chassis sorted. However – memo to self – before I start planning the next trip, there’s a novel to be written! Thanks so much for reviving old memories of trips in a camper in Canada and of wonderful days spent in the beauty of the Lake District. You might want to try some rubber net sheets between your plates to avoid slippage during travel. So pleased you enjoyed it, Trevor – and yes, you’re right about the non-slip mats. Somewhere we have a whole roll of non-slip rubber mesh – just need to remember what we’ve done with it! Glad you enjoyed your trip to our part of the country. We are really Northumbria and very different from the south. Between the Wash and Hadrian’s wall, seems to me a solid block dating back to the Anglo-Saxons and beyond. A wonderful country with a wealth of history, sandy beaches and heavenly hills. Have made a note of Harefield Hall, and The Roebuck for future days out. Thank you. Just hope they don’t close down. Some of the nicest places do. I think you’re safe with The Spite (Roebuck) near Otley – it remains very popular. Can’t say for Harefield Hall, although being a hotel – pretty up-market and in a beautiful area – one hopes they continue to do well.